Are you tired of telemarketers calling you every single day? Whether you like it or not, telemarketers will continue to call you even if you say, “I’m not interested” or you repeatedly hang up on every call. In fact, “I’m not interested”, “No, thank you.” and Hang up are common responses telemarketers get from their prospects. So don’t expect them to leave you the minute you say, “No!”. 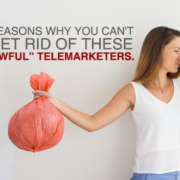 Here are the 2 main reasons why you can’t get rid of these “awful” telemarketers. Most prospects think telemarketers don’t listen. Well, in fact, they are the one that is not listening. I’ve been a salesperson for more than 10 years. Whenever I encounter a prospect who keeps on telling me he’s not interested even before I started telling him why I called, is considered a good prospect to me. Why? It could be that the prospect is busy or in the middle of something so he doesn’t have time to talk right now. What I’ll do is take note of this prospect and set a reminder to call him after a week or so to check if he’s available to talk. Let telemarketers talk. Find out what they are offering and see if it can be beneficial for your company. Once you do and found out you don’t need their services, then tell it to them. #2 Prospects fail to provide the reason why he’s not interested. As a salesperson, I don’t want to waste my time calling a prospect if I know there’s no opportunity for me to do business with them. So if I called and you told me, “no”, then immediately end the call, you’ll probably hear from me again, soon. Tell the telemarketer why you’re not interested. Whether you are already using that product or you have a provider or consultant. Let them know, so they’ll understand why you don’t want them to call you again. #3 Don’t just hang up. Salespeople are professionals. They undergo months of training to perform their job well. Not to mention they called and ask to speak with you in a professional way. They deserve to be treated professionally. Act professional and treat they right. You’ll see they’ll treat you better than you expect. So listen up! The next time a telemarketer calls you, give them at least 5 minutes of your time. Hear them out and let them know whether there’s an opportunity or not. When they found out you don’t need their product or services, they won’t bother calling you again. If there is also a quality that you have to emulate from successful telemarketing representatives, then it has to be their humility. Even the best among men can make a mistake, but it takes exceptional people to admit that they did. But that is the secret for a successful relationship building with potential B2B leads. It is good to really be knowledgeable about your business, but you cannot really have everything at your fingertips. In case you are lacking, admit to your short-comings and make sure that you get back to your lead generation prospects once you have what they need. It is not that hard to imagine just how difficult it is to be honest and simply admit that you have made a mistake, or fail to deliver. That is bad news for business. And it is only natural that you would try to deny it or make excuses for it. Now that would be much worse. Also, it does not really hurt if you ask help from others, especially if those people are much more knowledgeable than you in terms of business and market experience. Yes, you might look stupid at the start, but once you got things right, you will also look right. Another thing, remember that appointment setting requires some level of negotiations, so be prepared to give some compromises to your prospective sales leads. True, being humble and really willing to help your prospects can help you be more successful in your lead generation campaign. Of course, not all successful telemarketers possess the same qualities. There will be some who would be different from others, in terms of how they conduct their lead generation campaign or the kind of sales leads they wish to generate. Still, the one common tie that connects them all is this: they can sell. And when it comes to selling, they are actually very good at it. Despite the negative perception of the term ‘selling’ in the minds of a lot of people, there are things we do that actually possess the nature of selling, not to mention these are the very things that we can emulate for ourselves. For example, good sellers can explain their side properly. You do not have to actually sell something, but the mere fact that you can get your ideas across other people is actually a very good habit. Also, good sellers are excellent listeners. This is something you will need in your appointment setting process, since you will definitely be making some negotiations at this point. Another quality of selling that you can follow is the act of compromise. No one can have everything in this world, and that is the same thing with business. You have to adjust to the needs of your prospects before you get them to become B2B leads. There are other qualities is selling that you can emulate from successful marketers, and you can learn these along the way. Anyway, if you actually deliver what you promise, your telemarketing campaign would be more successful in the end. Another habit of excellent lead generation specialists is with regards to momentum. Once they have started their work, rarely will you see them stop. If they did, they would probably be switching gears or improving their offer, which would translate to better sales leads. A good marketer would be content with the success of their current campaign. An excellent one would try to find more ways to improve and make more money. This is a habit that will surely bring you more benefits in terms of B2B leads generated. But the question here is this: how will you go about it? First, you need to actually start something. No matter how good you are in getting the telemarketing job done, if you did make any effort to actually do something, then nothing will come out of your efforts at all. Second, try shutting off all distractions during your work. Be it your cell phone or emails coming in, once you are in the middle of your work, you should only concentrate in what you are doing. Answering all your emails (which will never end) or looking at your phone (which can pretty much be all the time) will not only waste your time, but will also reduce your productivity. And lastly, look to do better. A hallmark of successful appointment setting campaigns is the constant improvements done to maximize impact on the audience. Do these things, and you can be sure to be successful in your overall lead generation campaign. The mark of an excellent telemarketing representative also consists of having a high aim. That is an essential part of a successful lead generation process. After all, having a goal can concretize your efforts, helping you maintain your pacing. Of course, when it comes to goals, you need to know what exactly it should be. Setting your sales leads aims too high will lead you to fail, while setting them too low will also cause you to be mediocre. In this case, you need to remember a few important points. One, it must be a personal goal. Sure, you should follow the general aim of your marketing team, but if you do not put a personal intent in it, then you will lose steam in the long run. You have to make your aims your very own. Second, it must be feasible. As I have mentioned earlier, your aim will determine the success of your campaign. So, if you set your appointment setting goals too high, you might not be able to reach it, discouraging you. Set it too low, and you will not be able to shine. Lastly, it must also be measurable. You need to quantify the success or failure of your campaign, which means you need to conduct it through a measurable medium. For example, you can use telemarketing. It is very affordable, and it can reach a lot more prospects in a single day. Plus, you can measure it, too. Follow these, and you can aim high in your lead generation campaign. There are many good habits that successful lead generation representatives can practice. The third point to consider would be the idea of going against the trends. Following trending topics is fine. Come to think of it, this is an important part of the marketing process. You need to know what is foremost in the customers’ mind, and use that knowledge to craft a better plan in generating qualified sales leads. Failure to do so would only weaken your appointment setting capabilities. What do you think made marketers stand out? What made Steve Jobs, Jeff Bezos, Bill Gates, and Warren Buffett win? They went against the flow. Despite what the market trends showed, these people decided to go ahead with their revolutionary changes. The result is an astounding increase in sales and profits. Sure, these did not occur overnight, but the mere fact they went against conventions of their time changed the world we are living in today. Instead of following a sure trail, blazing a new path can bring you better results. It can be in the form of products you offer, or the marketing tools you use, even the likes of telemarketing. All these things can play a big role in your success in B2B leads. Do not be afraid to go against the flow. Yes, the risk of failure is high, but the rewards you get if you succeed will more than make up for it. Just do your best, perform your research, and believe in what you do. That will give you success in your lead generation campaign. No phones – turn off your phones when you are already in your work station. Unless someone needs to contact you by phone, there is no need for it in the usual run of the day. Besides, if your phone receives a call, it can create a nasty feedback with your telemarketing equipment. No emails – checking emails is good, but doing that all the time will just waste your time. You can just open it at the start of the shift, and then check in again before the day ends. That would be enough to tell you if there are any tasks to be done. No gossip – really, that should be the last thing you should be doing, since it wastes a good amount of your time, not to mention giving you useless information. Better concentrate with your own lead generation work, which is a better idea. Really, just do these things, and your appointment setting campaign will be all right. One of the most important components of a successful lead generation campaign would be the people leading the frontlines. 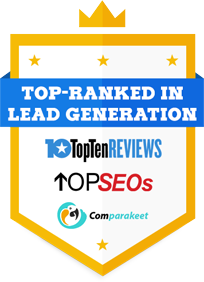 They are the ones responsible in generating qualified B2B leads, so they have to be the very best in the business. There are different kinds of successful people, with qualities that made them so. You can be one of such people, provided that you know how to actually pull it off. You see, the secret to a successful appointment setting process lies in your business habits. Developing these would be to your advantage. Now, let us discuss one of these points: having no back-up plans. Back-up plans are good. It provides you with a fall back platform in case your initial lead generation plan fails. While this can give you some breathing space as you plan your next marketing move, a disappointing trend has been developing among many marketers, especially those in telemarketing – they always depend on the back-up plan. Because of this, they end up slacking off or slowing down in their work, which translates to a reduction in sales leads production. Truly, if you want to be at your lead generation best, you should work like you have no back-up plan. Having such a mindset will compel you to do your best at the initial business campaign. A lot of successful telemarketers have done that in the past. Besides, in this fast-paced business environment, creating a back-up plan can be an unnecessary burden. Better give you best at the first try, so you have fewer problems to think about. Trade fairs are a popular way to network with new and existing clients, and are great places to find hot sales leads. However, it’s no secret that trade shows can be quite expensive, which is why you have to make sure that when you attend or host a trade show, a good quantity of qualified sales leads must be present. Invitation methods to these events can vary, and there are various options you can choose. One good choice is to hire professional telemarketers to increase the number of attendees of your event. These outbound telemarketing professionals help to make sure that your targeted leads actually attend so that you don’t just end up with a venue full of absentees. Anyone who’s been through a trade fair before knows that invitees have a tendency to promise an attendance, and yet when the scheduled date arrives, they suddenly have an important matter to attend to instead. Professional telemarketers from a reliable lead generation company can increase the likelihood of your sales leads attending by reminding them of the event a few days or even a few hours prior so that they don’t forget. But that’s not all they can do to help you. These outbound telemarketing professionals can also follow-up on your leads right after the trade show, which further increase your chances of closing a sale with your leads. So for your next trade fair, find the right telemarketing company that can provide you with professional telemarketers who have years of experience doing event telemarketing, and you will have better ROI on your next event. Hiring telemarketers en masse – hiring a large number of telemarketing people within a short period of time means you spend less time evaluating the skills of each person. This will only jeopardize your business and require you to pay people for work that they are not qualified to perform effectively. Giving them a calling list that includes…just about everyone – your telemarketers receive the full force of rejection and anger from irate sales leads everyday, strive to reach quotas and yet still manage to assume a happy disposition for every call. The least you can do to help your professional telemarketers do their job properly is to arm them with a well-targeted list to give your telemarketers a better chance of reaching their quotas and limit the number of unrelated, irate calls, effectively reducing stressors. Setting unrealistic goals – setting impossibly high quotas that your telemarketers could never reach will cause a huge blow on their morale. Eventually, they’ll just stop trying to get even one successful sales lead because they feel all efforts towards reaching your absurdly high quotas are useless . On the other hand, giving them realistic goals will encourage them to strive harder and even surpass the limits you’ve set, which means more sales leads and higher revenue for your company. Undermining a telemarketer’s free will – give your telemarketers some space to actually use their own God-given skills to solve problems. Hawking over them to monitor every little detail of their work will only increase their stress levels, which means they are not in optimal shape to qualify leads, handle technical support issues or even sell products and services. Eagerly promoting top performers to management – do you really expect your sales leads to soar by removing your best telemarketers from the production floor? Unless you are confident that your top performers have the skills to become great managers, you might want to keep them burning the phone lines a little longer. Scrimping on additional training – experience beats training, you might argue. But keeping your frontliners regularly updated with current trends in telemarketing best practices will help improve their overall work performance in the long run.